Daisaku Ikeda is the president of the Soka Gakkai International (SGI), a Buddhist association of more than 12 million members in 190 countries and territories, and founder of several educational, cultural and research institutions. Daisaku Ikeda became the third president of Soka Gakkai on May 3, 1960, in Japan. He was forced to resign from its presidency on April 24, 1979, to alleviate the tension between the Nichiren Shoshu priesthood and the Soka Gakkai lay organization. This incident and its related issues was later called the first temple issue. 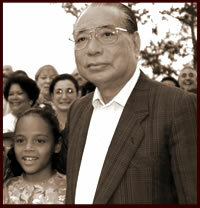 In 1997, after 18 years had passed, SGI President Ikeda started speaking out about the struggles he faced during the first temple issue. Commemorating March 16 and April 24, the Soka Spirit team of Southeast Zone has taken the initiative to compile information concerning the first temple issue. Our hope is that as many people study the content of this website, especially youth division, and present the material at appropriate district discussion meetings.